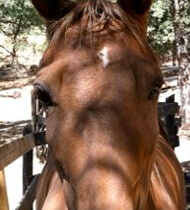 A few months ago, we helped two horses who were suffering a great Vitamin E deficiency. Remember? Chatterbox and Blue. Well… I got to thinking… I had a mastiff who passed from an elusive muscle disease when he was still a puppy. After the necropsy, it was determined that he had a Vitamin E deficiency. And, if we had determined that in time, we could have helped him. Why wasn’t this on my vet’s radar? I figured it was rare or a fluke or… dunno. But then when I heard about Chatterbox and Blue, I did research on Vitamin E deficiency – and I thought I’d pull you all in on what I discovered. 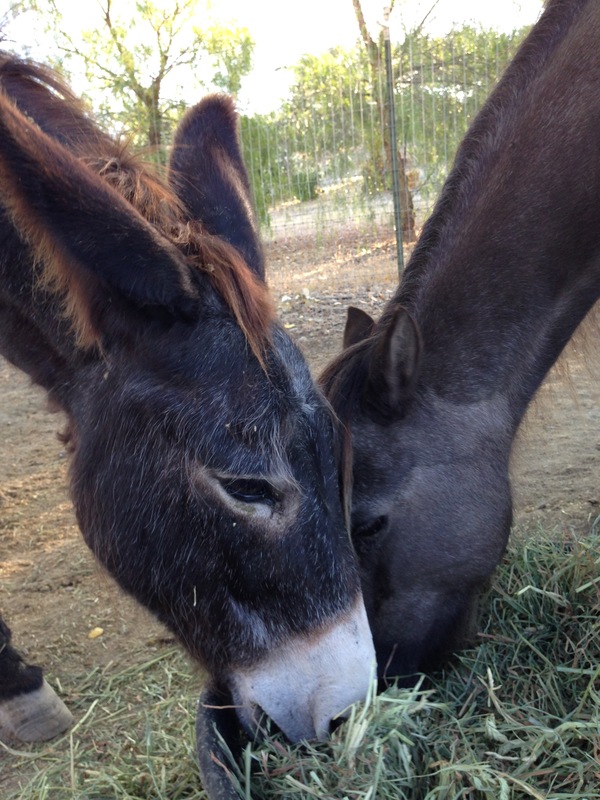 My Norma and Dodger are elderly with Cushings… I just purchased Vitamin E for them. Vitamin E is sourced through green grass. 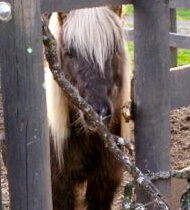 Most grass hay only has remnants of Vitamin E when it is fresh. The longer the hay sits, the less the Vitamin E.
As a horse ages, Vitamin E helps with ‘older horse’ diseases like Cushings. 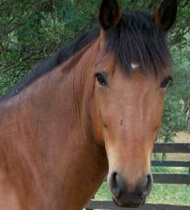 Young horses who may have a genetic tendency to not absorb E well, benefit from supplementation. Read the label! 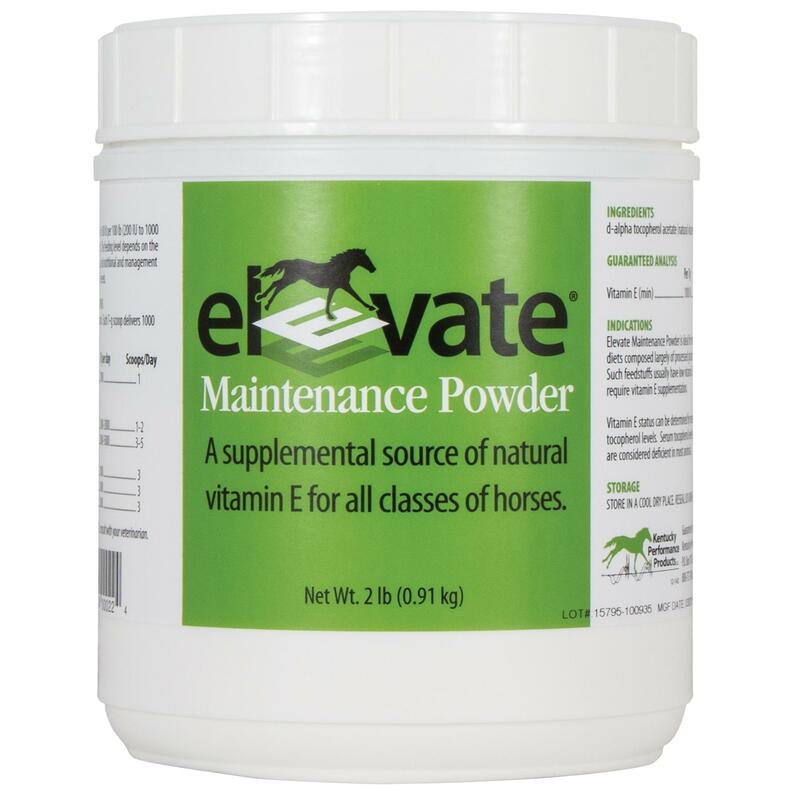 For Vitamin E to be stabilized and actually work for your horse, it has to go through a few processes (which makes it more expensive). Look for the words, “Alpha-Tocopherol Acetate” which means it is stabilized. 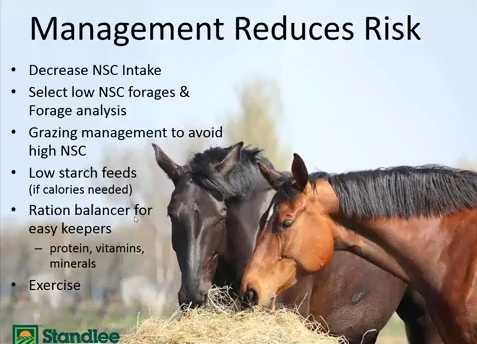 If your horse is already showing neurological signs of Vitamin E deficiency, you can help them but it is not curable or reversible at that point. So, dose them NOW, before you see signs. 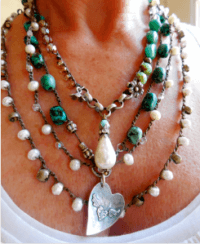 This is what I purchased – and where for the best price today – upon the recommendation of Darla from Strawberry Mountain Mustangs who rescued and treated Chatterbox and Blue. 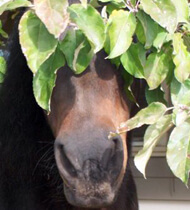 I found several articles on Vitamin E for horses, but I thought this short, succinct article written by DVM Frank K. Reilly for Holistic Horse was the easiest to understand. Vitamin E is the #1 antioxidant in the body, protecting individual cells every day. 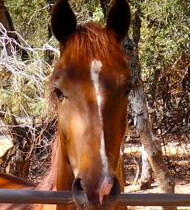 It is in every cell of your horse’s body and unique in being able to cross into spinal cord, brain, liver, eyes, heart, skin, and joints. In addition to being an antioxidant, Vitamin E is a “potent anti-inflammatory when given in high levels,” according to a University of Florida study. 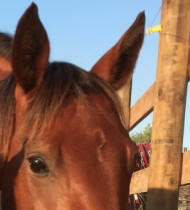 Your horse does not make Vitamin E. Daily outside sources of Vitamin E are required to maintain the right blood and tissue levels to help protect cells. Nerve tissue especially requires Vitamin E to function properly. 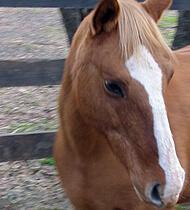 Horses quickly get deficient if they engage in moderate to high amounts of physical activity. Fresh grass changes throughout the year in its amount of Vitamin E. In October, the amount of Vitamin E in grass is very little. Levels in the winter (November-March) are at zero. Even on 12 hours of grazing April-September, horses will get only an estimated 1500-3000 units a day. 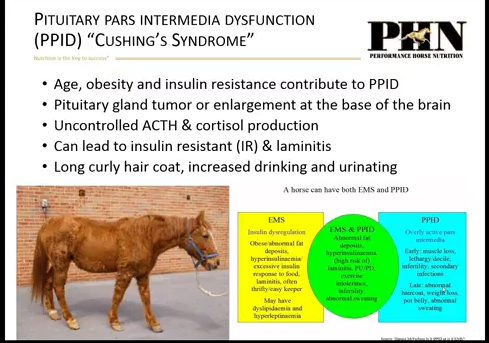 Neurological conditions like EPM require large doses of Vitamin E due to high oxidative stress quickly depleting Vitamin E. The AAEP recommends 10,000 IU a day for several months; in our practice we will have horses go on 20,000 IU a day for 7-10 days and drop back to 10,000 a day in severe neurological/PSSM cases. In older horses, Vitamin E supplementation has been proven to increase antibody levels which can protect them from sickness and help ward off infections from Cushing’s disease. 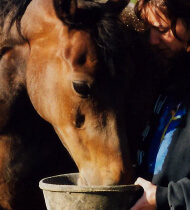 In broodmares, it is shown that supplemented Vitamin E did pass through to milk and increase Vitamin E levels in foals, and also increased immunity cell levels from the mare to the foal. 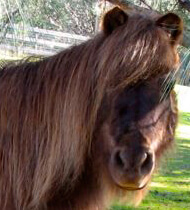 This can avoid many early-stage infections in foals. 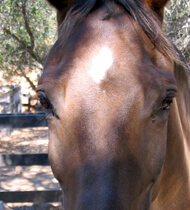 Horses have no toxicity problem with Vitamin E even at very high levels, making it the safest vitamin to supplement. 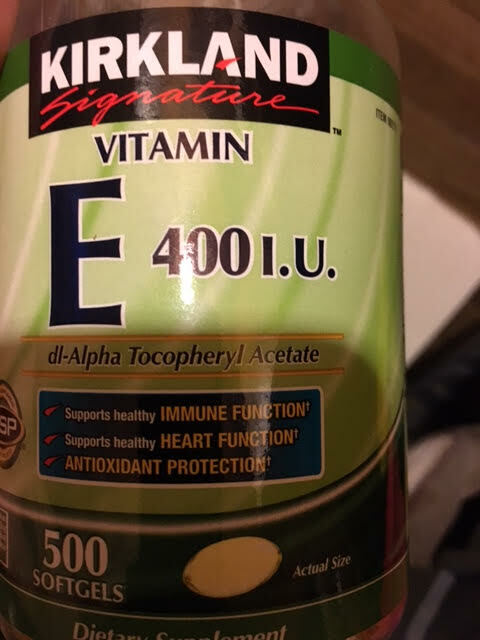 Alpha-Tocopherol is the only form of Vitamin E with a transporting enzyme, allowing it to pass through the liver and, via blood, go to other cells. Other forms are broken down, eliminated in urine or manure or converted to Alpha-Tocopherol. In nature, the Alpha-Tocopherol portion is often only 10-15% of the total Vitamin E in the oil of the plant, but it’s the one that counts. Oils from Wheat Germ and Soy have large amounts of Alpha-Tocopherol but adding raw oil will not help your horse’s Vitamin E levels. Why? The Alpha-Tocopherol is very susceptible to heat, oxygen, and light – even fluorescent light will quickly destroy it. Just opening the bottle of oil would expose it to air and destroy most or all the Alpha-Tocopherol. 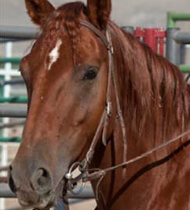 Alpha-Tocopherol is the only form stored for a small period in tissue, the only form metabolized by the liver, and the one with the most biological antioxidant action, so this is the form your horse needs. Supplements with lots of Gamma-, Delta-, or Beta-Tocopherol are not going to help. Pure plant oils may have good amounts of omegas but are poor Vitamin E sources. 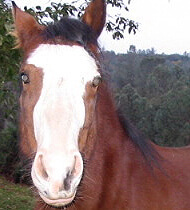 A reader just emailed me and said that her vet told her to use Costco brand Vitamin E with the label “Alpha-Tocopherol Acetate” for her horse with muscle wasting. She said she sees a remarkable difference! This bottle of 500 gel caps costs around $9.99. She puts 10 on his grain/supplement bucket and he eats them no problem! 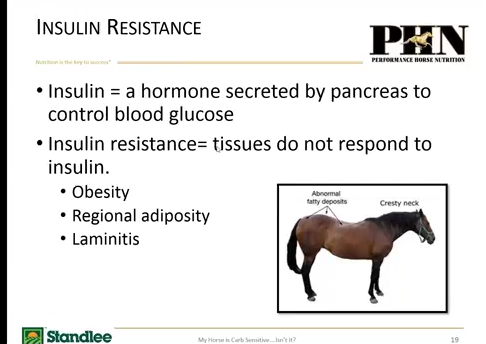 “MY HORSE IS CARB SENSITIVE, ISN’T HE?…” Cushings, PPID, Insulin Resistance, “Easy Keepers”, etc and NUTRITION. How to help your Carb Sensitive horse! VERY IMPORTANT! AMAZON SMILE IS OFFERING A HUGE GIFT TO NON-PROFITS TODAY ONLY (MARCH 16). ANYTHING YOU PURCHASE FROM AMAZON TODAY, THROUGH THIS LINK ,will give 5% to The Drop in the Bucket Fund! A huge boost! Again, use this link to purchase anything through Amazon and benefit the Bucket Fund! TODAY ONLY. Many thanks! Mama Tess was IR, Cushings and a bunch of other things that made her very sensitive to Carbohydrates. I was constantly monitoring her food so that nothing would aggravate her condition. 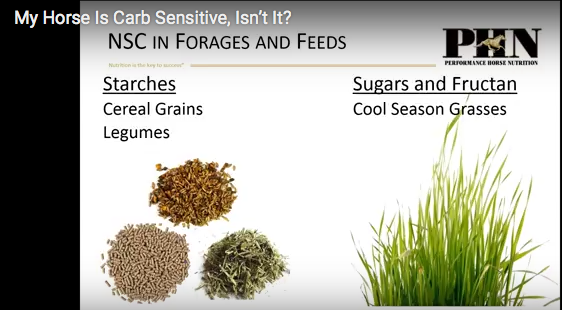 I WATCHED THIS WEBINAR ABOUT CARB SENSITIVITY – NO AFFILIATION! 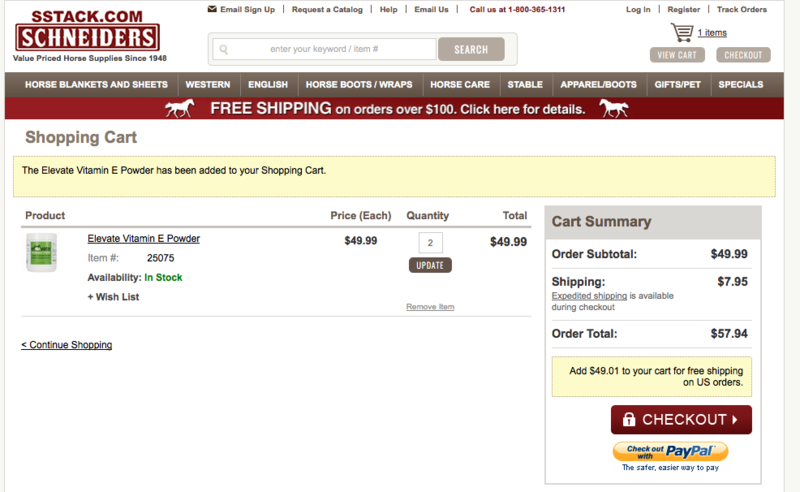 So, I was asked by Standlee Nutrition if I wanted to join a seminar on carb sensitivity in horses. Well, I’m not a great fan of webinars – sitting in front of my computer for an hour, trying not to be distracted – but I knew that I should, so I could learn as much as possible about these conditions. 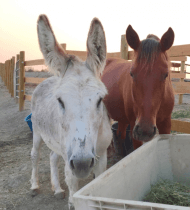 I’m sure Gwen (MT’s first foal) will develop some sort of sugar issues as she advances in age… and Dodger already has Cushings. I figured it would be good for me to watch. And… I was surprised. 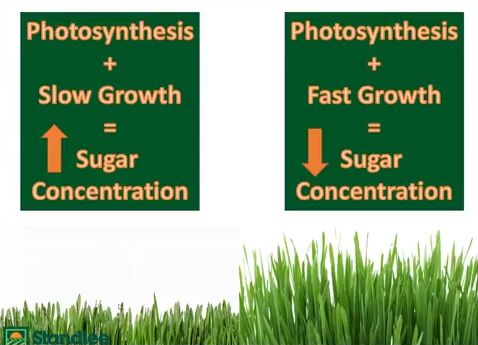 The information wasn’t just an overview, it went into detail about all the different diseases associated with carb intake, NSC, how grass is grown for hay, ways to test for sugars, methods of reducing sugars, physical signs of horses in the danger zone… I thought it was informative, easy to understand and worth the time spent. So, I asked if I could share the webinar with you… and they told me that they had just uploaded it to their website. Yay! You all can benefit! 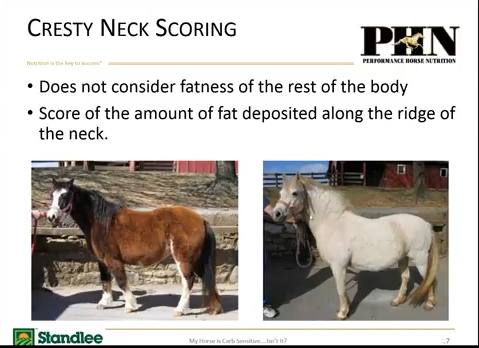 *The Equine Carb Sensitivity video is on the Standlee website, but the video doesn’t push their feed or direct you to their site with offers and coupons. In fact, much to my dismay, Standlee doesn’t produce a ‘low carb’ feed. So, this webinar is not a sales pitch – it is education. 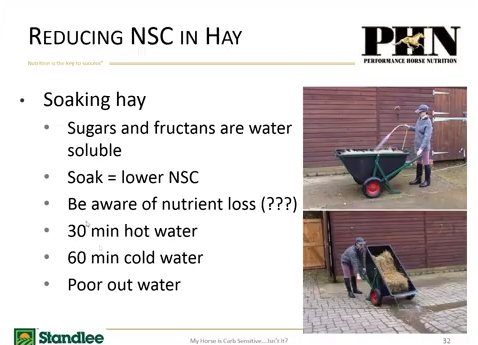 But, all in all, a very nice overview of the issues associated with Equine Carb sensitivity. 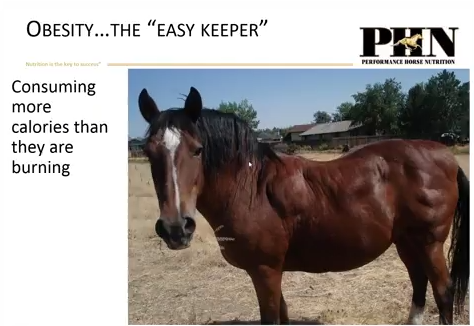 I think it is very worth the time to watch if you have any suspicion – or if your horse is an ‘easy keeper’. 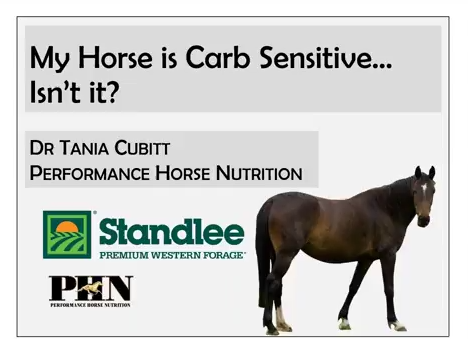 Click here to watch the Equine Carb Sensitivity Video! I GRABBED A FEW STILLS FROM THE POWER POINT. 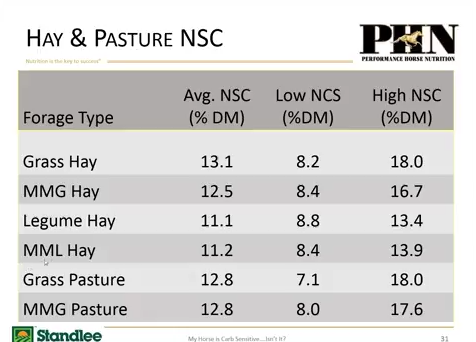 SO MUCH INFORMATION IN THIS WEBINAR! Again, the link to the webinar video is here. 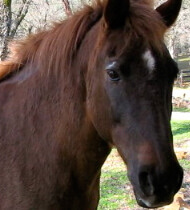 MARCH BUCKET FUND HORSE, SWAYZE, NEEDS SURGERY TO SURVIVE (his story here). 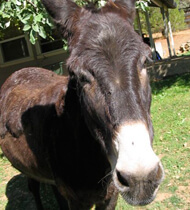 Swayze’s Drop in the Bucket Fund only needs $595 to give him his lifesaving surgery! Just a few drops will add up! Thank you in advance! 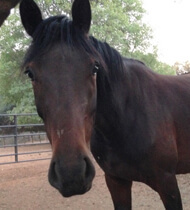 Do you have Starbucks money to donate to this very handsome gelding? He has fought so hard to live! Thank you!! Make a 100% tax deductible donation here! On the trailer after surviving the slaughter feedlot. 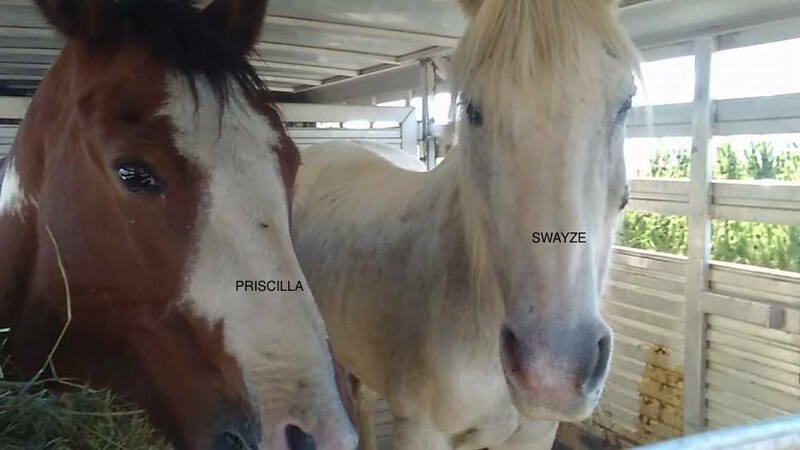 Best friends, Swayze and pregnant Priscilla.